Today there is an assortment of Robin Williams photos and quotes to choose from, and I’m sure an overwhelming amount of them appear on the blogs, websites, and profile pictures of people everywhere. 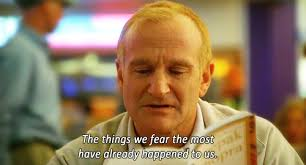 I chose the one accompanying this post because One Hour Photo is my all time favorite Robin Williams movie. It was dark, horrific, yet touching and relatable. Fans, friends and family of Robin Williams, we all have this in common: We received the news yesterday like a punch in the gut. We were all at once, shocked, confused and deeply saddened. A heavy bulk of us also have this is common, which also, I’m sure is the topic of discussion on many a blog: we deal with, have felt or seen the effects of depression. I’ve talked about it here before. I talk about it quite often, actually. There’s a whole category dedicated to it here. And like many, on my good days, my mask does it jobs, hides the tears that most times I have no explanation for, hide the emptiness and sadness in my eyes. Also like many, on my worst days, I can’t get out of bed, can’t stop the tears from falling, and sometimes consider other…options. There are reasons. Could I name one? I could name several, but there would still be those who have their own feelings and judgements about suicide. Of course there’s help and maybe there’s hope, but I think the point that many people miss is that no matter how much help, how much hope there is out there, a person in the deepest pit of depression can see none of it. The most furious my husband has ever been with me was when I confessed to him not long ago that I had seriously considered suicide early in 2012. I had mentioned it before, but he always thought I was kidding. I was feeling the effects of late stage Lyme Disease, and at that time I hadn’t been diagnosed. The only thing my doctor could tell me was that I was experiencing a neurological emergency. I couldn’t eat. I couldn’t get out of bed for days. I was starting to lose my vision. One Sunday when my children were with their father and my husband was at work, I saw my chance. The only thing that kept it from happening was that I was out of bullets (and I never, ever run out of bullets) and I was in too much pain to get up and drive to the store. The next day I was properly diagnosed and began treatment. That wasn’t what I would call a wake up call for me. Things still get heavy enough for me to topple over, but I think back to that day a lot. I think about my children who were only nine then, and who themselves struggle with so much at their young, delicate age. Much of the time, I’m their only cheerleader. What would happen if all of a sudden, I wasn’t there? That’s what keeps me on track mostly, but like I said, things still get heavy, even in the seemingly best of situations. I don’t have a witty or pretty way to wrap all this up, but I will say this: You don’t know, you’ll never know, until you know. Word. And hugs to you. I suffered from depression for a very long time. One time I grabbed the phone and a butcher knife and one of them was going to win. I am pleased to say that I called a friend who stayed on the phone with me until the knife was no longer an option. People think they know but they have no idea. Thank you, Dominique, and hugs to you as well. I totally agree, people have no idea. That was hard to read, Tenille, but it’s even harder to find something helpful to say – apart from keep reaching out to people.